Two days before Donald Trump became president, the Puget Sound Federal Task Force released a draft of the federal action plan for the recovery of Puget Sound. Speaking last month before the Puget Sound Partnership’s Leadership Council, Kopecky acknowledged that the plan would go through many changes over time, with or without a new president. The plan is formally called the “Interim Draft of the Puget Sound Federal Task Force Action Plan FY 2017-2021” (PDF 1.7 mb). It can be found on the website of the Puget Sound Federal Task Force. The federal Action Plan emphasizes that its goals largely come from the Puget Sound Action Agenda, approved by the state’s Puget Sound Partnership. The federal plan also relies upon other planning documents, including salmon-recovery plans, but it “may also include priority federal actions not addressed in the Action Agenda or salmon recovery plans,” as stated in the introduction. The federal task force was established in October through a memorandum of understanding among nine federal agencies, including the departments of Interior, Commerce, Agriculture and Transportation, as well as the military and the Environmental Protection Agency. The big issues are laid out in sections within the plan and expanded with additional descriptions. For example, “Remove fish-passage barriers” is a heading, followed by descriptions of needed roadwork in national forests, national parks and U.S. Navy property, along with improved facilities at Mud Mountain Dam in King County. The plan goes on to describe a variety of programs for which federal funding can be used to improve critical fish passage in a variety of watersheds, not only on federal land but also on state, tribal and private property. On federal lands, the plan calls for restoring watershed function — including the ongoing decommissioning of 1,425 miles of forest roads in Olympic and Mount Baker-Snoqualmie national forests that have been deemed as high risks for aquatic life, including salmon. The Coast Guard is committed to working on spill prevention from vessels through increased inspections, managing vessel traffic and addressing potential risks. At the same time, the agency says it will maintain a robust “Area Contingency Plan” to minimize the damage from spilled oil and hazardous substances. Working with Canadian officials also is important, the plan says. To improve scientific knowledge, the federal task force will work with state agencies to develop science and monitoring programs. 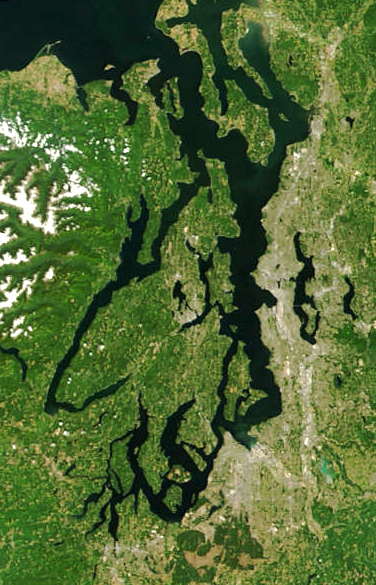 The Federal Science and Monitoring Work Group will convene at least one workshop in the next five years to develop an adequate monitoring plan for Puget Sound. The task force also is committed to addressing tribal treaty rights by working with tribes on various issues, the plan states. Issues of special concern to the tribes include nonpoint pollution, shoreline armoring, cumulative effects under Army Corps of Engineers general permits, agricultural practices, streamside buffers and sustainable harvests of fish and shellfish. The plan also identifies financial and staffing needs for each of the proposed projects, which total around 75 different efforts, as listed in Appendix B (PDF 1.7 mb). Of course, the entire plan depends on federal funding, and it isn’t clear what money will be available under the new administration of President Trump. While running for office, Trump mentioned eliminating the Environment Protection Agency, through which many of these restoration dollars pass. It is impossible, at this point, to predict what the Trump administration will do. I was planning to phone a variety people closest to the issues of Puget Sound and ask them what they think will happen. But what’s the point? Even Trump’s closest advisers don’t seem to know what he will do, and the focus at this point seems to be confirming his chosen EPA administrator, Oklahoma Attorney General Scott Pruitt. That was followed by an acknowledgement that EPA scientists will have their research reviewed on a “case-by-case basis” before it can be released to the public, and outward communication from agency officials would also be limited. This information was confirmed in an NPR interview with Washington state Sen. Doug Ericksen, R-Ferndale, who is heading up communications for Trump’s EPA transition team. U.S. Sen. Derek Kilmer, D-Gig Harbor, is among the signers. The letter also raises questions about the legality of holding up funding, which has left state agencies wondering how to proceed with their grant programs. On Tuesday, Sen. Tom Udall, D-NM, sent a similar letter as the ranking member of the Subcommittee on the Department of the Interior, Environment and Related Agencies. Needless to say, there is a lot more at stake here than Puget Sound, but I will try to keep up with the Trump transition as it relates to “our water ways” here in the Puget Sound region.